This contemporary urban ‘eco-home’ respects its Conservation Area context without resorting to pastiche, and was designed with sustainability in mind for reduced running costs. Designed to be ‘future-proof’ for its owners, a retired couple, the house exploits an existing storey-height bank on the tight site to provide single-storey living at first floor – flowing open-plan kitchen, dining, living room, master-bedroom with en-suite wet-room and a small, manageable garden. This main floor is accessed by lift from the ground floor entrance lobby and under-croft parking built into the bank. A galleried stair up from first to second floor creates a double-height space over the dining area and gives access to three further bedrooms. The house uses traditional forms and materials to create a ‘resonance’ with its historic surroundings, but refuses to ape its historic neighbours. 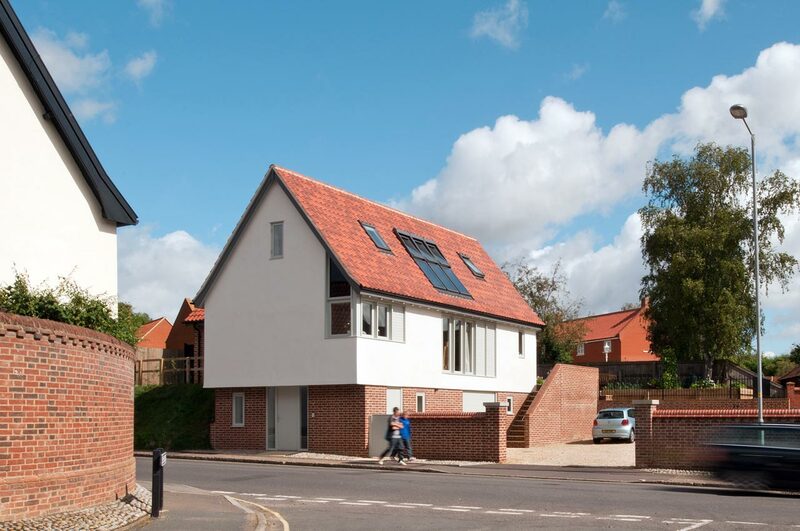 This is a clearly contemporary addition to the Conservation Area. A full range of energy-saving features are included for reduced running costs: a heavily insulated airtight timber-framed shell with triple glazed windows, whole house-ventilation with heat-recovery, low energy light-fittings, rainwater harvesting for WC-flushing and roof-integrated solar-thermal panels. Designed by Matt Wood of Lucas Hickman Smith with detailed design by Andy Love.